Top Diagnosis - Sourcing of diagnostic equipments and diagnosis apparatus, covering diagnostic equipment development and medical market news. Jamaica Health Minister Ruddy Spencer is promising that the Kidney Diagnostic Centre at the Spanish Town Hospital in St. Catherine should be operational soon. It is reported that the Kidney Diagnostic Centre costs multi-million dollar. Since the construction of the state-of-the-art facility last year, the centre has remained useless due to a problem with the treatment of water to be used at the centre. The machines in the facility are unable to work efficiently due to poor water quality. Speaking with RJR News the Health Minister said the problem will be corrected in a matter of weeks. The construction of the unit was funded by prominent Spanish Town businessman Ernest Hoo in the memory of his late mother. Cancer is a class of diseases in which a group of cells display uncontrolled growth, invasion, and sometimes metastasis. These three malignant properties of cancers differentiate them from benign tumors, which are self-limited, do not invade or metastasize. Most cancers form a tumor but some, like leukemia, do not. The branch of medicine concerned with the study, diagnosis, treatment, and prevention of cancer is oncology. Cancer may affect people at all ages, even fetuses, but the risk for most varieties increases with age. Cancer causes about 13% of all deaths. According to the American Cancer Society, 7.6 million people died from cancer in the world during 2007. Cancers can affect all animals. A man in Fuling county, Chongqing municipality, lost his wife soon after he was diagnosed with liver cancer. Yu Daohua, 44, is undergoing medical treatment at a local hospital with help from his 80-year-old mother. This is after his former wife, Ju Feng (not her real name), 35, asked for a divorce. The couple has married for five years and has a daughter. His wife said the marriage wasn't good. "We had lived separately for more than half a year and I decided to divorce him, not because of the cancer," the wife said. In Los Angeles, a group of American scientists are developing a new iPhone as a medical diagnostic device. The United States of hematology and oncology consultant Dr Iqbal said that on the one hand, such a mobile phone installs the most advanced software as a diagnostic device. Patients can store their medical history in the iPhone, then communication with the doctor will be easier, and this will also help doctors make more accurate judgments. On the other hand, the iPhone's camera has been transformed into a simple light microscope with a filter, and then connect with the computer. Making the use of a professional software analysis, will be able to detect a particular patient's blood cells. All this process can be completed in a several minutes. The iPhone is an internet-connected multimedia smartphone designed and marketed by Apple Inc. with a flush multi-touch screen and a minimal hardware interface. The device does not have a physical keyboard, so a virtual keyboard is rendered on the touch screen instead. The iPhone functions as a camera phone (including text messaging and visual voicemail), a portable media player (equivalent to an iPod), and Internet client (with email, web browsing, and local Wi-Fi connectivity). The first generation phone hardware was quad-band GSM with EDGE; the second generation also adds UMTS with HSDPA. Apple announced the iPhone on January 9, 2007. The announcement was preceded by rumors and speculation that circulated for several months. The iPhone was initially introduced in the United States on June 29, 2007 and has since been introduced worldwide. It was named Time magazine's "Invention of the Year" in 2007. On July 11, 2008, the iPhone 3G was released. It supports faster 3G data speeds and Assisted GPS. 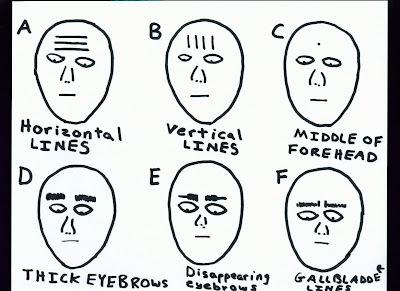 B = vertical lines on the forehead are rare. In very old people they indicate venerability and wisdom, in some cultures. In people over the age of 90 they may indicate kidney failure as well. C = A dot, pimple or blemish in the middle of the forehead indicates the functioning of the pituitary gland. 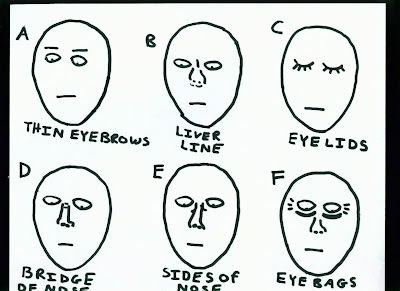 D = Thick, bushy eyebrows indicate an abundance of natural vitality or inherited good health. E = cheeks are divided into triangles with upper, middle and lower sections. The upper sections correspond to the upper portion of the lungs, the middle to the middle and the lower to the lower. Left cheek to left lung, right cheek to right lung. 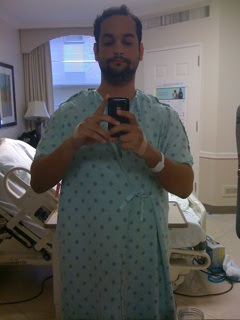 The color indicates the state of health. F = filtrum, that little divet just in between and below your nostrils and above your lips. If it is perfectly vertical, then it indicates good health. If it wrinkles, then reproductive health is poor. If it is at an angle, the person had poor health as a child. If it is close together it may indicate poor stomach health. D = bridge of the nose can help ascertain pancreas health. 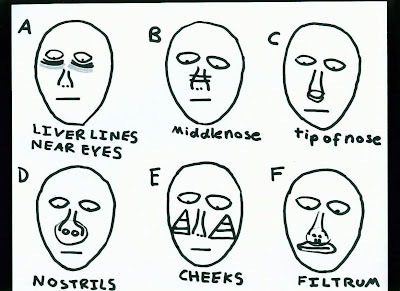 Also, flat noses indicate gentle or passive personality, hooked nose indicates stress and heart problems, a hump in the nose indicates that the person's mother eat plenty of chicken during the pregnancy and an upturned nose indicates the same phenomenon, but with seafood. B = The color of the lips indicate the state of health. Herbalists differ on how to divide the lips. Upper lip can be used to ascertain stomach health. The lower lip can be used to ascertain the health of the larrge intestine. OR the lips can be divided vertically. 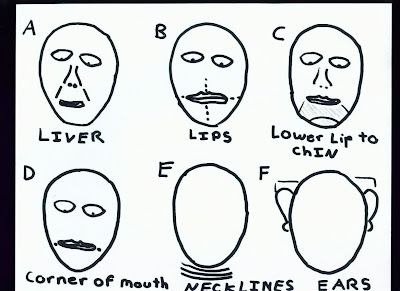 C = the area from the corners of the lower lip to the chin indicate reproductive health. Lots of blemishes indicate fertility. Prominent lines extending from the lipd downward can be interpreted as an induicator of strong intuitive abilities. D = dots or dimples at the corners of the lower lip indicate the health of the duodenum, part of the small intestine. F = distance between the ears and the head indicate personality tendencies. Ears that stick out may indicate athletic tendencies (see picture) whereas ears close to the head indicate a more intellectual personality. These are generalizations. In 2008, China exprted diagnostic equipments rose by 24.1%. Diagnostic equipments is the important category of medical devices exported from China. 2007 annual export of diagnostic equipments was up to 2.7 billion U.S. dollars, accounting for one third of exported medical device. In the global financial crisis, China's medical device products still maintain a relatively high export growth. 2008 January to November, the total export volume of diagnostic equipments reached 3.2 billion U.S. dollars, up 31.4 percent, much higher than the annual export in 2007. The export amount of November was 349 million U.S. dollars, higher than the previous 10 months of the average of 285 million U.S. dollars, an increase of 24.1%. On the 15 anniversary of setup, Huiyinbi Group signs a formal cooperation agreement with Tsinghua University to jointly research and develop oral endoscopic system. Using the oral endoscopic system will help you solve the following problems. 1. Small input improves clinics grades immediately ,so that the patients will receive your treatment program. 2. The product can promote the exchanges of the doctors and paitients , Achieving the desired effect of seeing is believing,It can reduce the intensity of the work of the docotors,increase the paitients confidence to the doctors. 3. It can perfect the attendance after review measures to make patients more satisfied .thus increasing the competiveness of your market. 4. It can create an electronic medical record management system, and is conducive to the exchanges of the doctors, in the event of medical disputes it can be proof. Taiwan singer Tank will over 27 years old. In the past years, he was diagnosed with severe arrhythmias, a type of genetic heart disease. 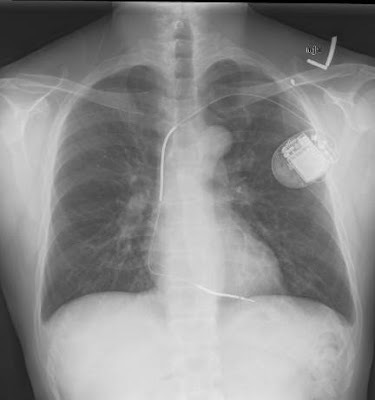 He gave his best birthday present, that is, an implantable cardioverter-defibrillator. Yesterday, Tank went to the Taiwan University Hospital for surgery-related procedures. He obviously feel nervous, asked a lot of questions, such as when the cardioverter defibrillator would play a role, and current stimulation will not feel uncomfortable. Cai Zhongwen, his attending physician said that the operation is in the left chest under the skin to install defibrillator. 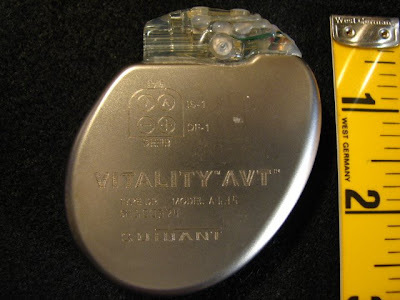 An implantable cardioverter-defibrillator is a small battery-powered electrical impulse generator which is implanted in patients who are at risk of sudden cardiac death due to ventricular fibrillation. The device is programmed to detect cardiac arrhythmia and correct it by delivering a jolt of electricity. In current variants, the ability to revert ventricular fibrillation has been extended to include both atrial and ventricular arrhythmias as well as the ability to perform biventricular pacing in patients with congestive heart failure or bradycardia. ICDs constantly monitor the rate and rhythm of the heart and can deliver therapies, by way of an electrical shock, when the electrical manifestations of the heart activity exceeds the preset number. More modern devices can distinguish between ventricular fibrillation and ventricular tachycardia (VT), and may try to pace the heart faster than its intrinsic rate in the case of VT, to try to break the tachycardia before it progresses to ventricular fibrillation. This is known as fast-pacing, overdrive pacing, or anti-tachycardia pacing (ATP). ATP is only effective if the underlying rhythm is ventricular tachycardia, and is never effective if the rhythm is ventricular fibrillation. Many modern ICDs use a combination of various methods to determine if a fast rhythm is normal, ventricular tachycardia, or ventricular fibrillation. Rate discrimination evaluates the rate of the lower chambers of the heart (the ventricles) and compares it to the rate in the upper chambers of the heart (the atria). If the rate in the atria is faster than or equal to the rate in the ventricles, then the rhythm is most likely not ventricular in origin, and is usually more benign. If this is the case, the ICD does not provide any therapy. Rhythm discrimination will see how regular a ventricular tachycardia is. Generally, ventricular tachycardia is regular. If the rhythm is irregular, it is usually due to conduction of an irregular rhythm that originates in the atria, such as atrial fibrillation. Morphology discrimination checks the morphology of every ventricular beat and compares it to what the ICD believes is a normally conducted ventricular impulse for the patient. This normal ventricular impulse is often an average of a multiple of beats of the patient taken in the recent past. BACKGROUND: Autism is a complex neurobiological disorder that typically lasts throughout a person's lifetime. It is part of a group of disorders known as autism spectrum disorders (ASD). Today, 1 in 150 individuals is diagnosed with an ASD, making them more common than pediatric cancer, diabetes, and AIDS combined. Autism was first identified in 1943 by Dr. Leo Kanner of Johns Hopkins Hospital. At about the same time, a German scientist, Dr. Hans Asperger, described a milder form of the disorder that is now known as Asperger's Syndrome. SYMPTOMS OF AUTISM: The earliest signs of autism are usually seen by parents and typically include unusual behaviors and failure to reach appropriate developmental milestones. Some parents describe a child that seemed different from birth, while others describe a child who was developing normally and then regressed. Lack of eye contact, repetitive behaviors and delayed or unusual speech patterns are just a few symptoms that are common in most ASD cases. TRADITIONAL SCREENING: There is no medical test for autism. The Centers For Disease Control has set guidelines that suggest all children be screened for autism during their 18-month, 24-month and 30-month well checks. During the screening, doctors look at behavioral symptoms, ask parents specific developmental questions, perform speech and language tests as well as utilize various other screening techniques. This screening cannot be used alone to make a diagnosis, but a positive screening should be followed up by further assessment. EYE TRACKING: Researchers at Yale University are studying detailed eye tracking technology as a means to diagnose autism at an earlier age. Ami Klin, Ph.D., and his research partner Warren Jones, believe through their research they will be able to put together a better picture of how a child with autism perceives the world. Their research began with toddlers whom they showed video clips from the movie Who's Afraid of Virginia Wolf? The children watched the screen while a hidden camera captured their eye movements. These eye movements can then be analyzed by technicians to determine exactly what part of the screen the child is fixating on at any given time. Data showed cognitively-delayed and normally-developing toddlers were more likely to fixate on a character's eyes, while children with autism were more likely to fixate on a character's mouth. The team's newest eye tracking research is being done with infants as they watch a video of their mother's face. DIAGNOSIS AT BIRTH? Taking early diagnosis a step further, Harvey Kliman, M.D., Ph.D., is studying microscopic differences in the placentas of children with autism. He found that the placenta of a child without autism looks like the branch system of a tree under a microscope with smaller branches stemming out from larger ones. The placentas of children with autism look different. Instead of having a pattern that branches out, some of the branches. WHY DO PEOPLE LIKE TO HAVE CHINESE FOOD?